Middle easterners do not have a monopoly on chickpeas. I recall back when I was growing up all my Italian friends ate them but they called them che che peas. We got them at Tom Naples market. I believe they are one and the same. They were dried though like a nut...they of course did not make hummus out of them they were too busy with pasta.....I guess there is no hummus in the south of France, Italy or Spain other than what they might have gotten ideas from the middle east. Thank you, thank you, thank you, Habibi! I detest supermarket hummus but have never had good results making it from a 1970's hippie cookbook I have on hand. This will put it back in my kitchen for good. I agree that Ziyad is a good brand overall. But one question: Does tahini go rancid on the grocery shelf? I recently bought it from a mass-market grocery store and it tasted a bit off. I also keep it in the fridge after opening, but should I put it in the fridge unopened? I have some sealed tahini in my fridge...its been there a while. I wonder if its still good. I keep tahini unrefrigerated. It keeps for many months, in my experience. As for rancid tahini on store shelves - if possible, check the use-by or production date to avoid such problems. toria wrote: I recall back when I was growing up all my Italian friends ate them but they called them che che peas. The Italian word is ceci -- unlike in English where a "c" before an "e" or an "i" it gets an "s" sound, in Italian the "c" gets an English "ch" sound making the word sound like "chetchy." To get the hard "c" sound before an "e" or an "i" you follow it with an "h", hence the word bruschetta is pronounced "brew-sketta," and not "brews-chetta" or "brew-shetta." In fact the French (and northern Italians) *DO* make good culinary use of chickpeas. In and around Nice you can get an unleavened chickpea pancake called "socca." I had them at the open market, where they were cooked on this flaming torch-thingy with a pizza-pan'ish plate on it. Very tasty! I don't think anyone asserted that the Levant had a lock on ceci. Great OP, by the way. Our friend the Roman orator had the name Cicero since his ancestors were chickpea farmers; the suburb is named for him via a predecessor (picked by a Classicist) in New York State. My mom's family uses ciceri (pronounced "CHEE-chi-dee") for them, which sounds a lot like the che-che-pea mentioned upthread. The fact that the last syllable in that case was changed to something with a double meaning English is characteristic of other Italian-American culinary terms, like "pull-patty" for "polpetti" (flattened meatballs, compare pulp; patties) which I've mentioned before. There must be a ton of other amusing metastasized words like this in other immigrant communities as well. Although my favorite chickpea dish is falafel, a close second would be panisse, which I believe are Southern French in origin. That used to be the primary reason for my many visits to Pili Pili on Kinzie some years ago. I never tried making panisse, but all this chickpea discussion is making me hungry for some! I am getting pretty close using the original recipe. The part I kept forgetting (after writing it down on paper rather than printing) was the simmering of the beans. I have used both the recommended canned variety and the same brand dried, soaked and pressure cooked. 1) A very smooth consistency - I use a Cuisinart food processor and it just does not seem to get it down to where I want it. It could be an issue with too little water - I am always hesitant to get it too wet. 2) Paprika - I've tried all sorts. It seems like no matter what I use it detracts from the flavor. Any suggestions for good pita bread in the Northern burbs? Neighbor Mike wrote: I am getting pretty close using the original recipe. The part I kept forgetting (after writing it down on paper rather than printing) was the simmering of the beans. I have used both the recommended canned variety and the same brand dried, soaked and pressure cooked. Paprika isn't really necessary. But you should be able to find decent Hungarian paprika at most grocery stores from the ubiquitous Szeged brand. And you can really use any kind of chile powder (I use coarse, oily Turkish urfa biber peppers), or fresh chilis, that you like. As far as getting it smooth - is this a problem with both canned and dry? If it's the latter, I would say you need to cook your beans longer, stewed until they are very soft. If we are talking canned beans, a small amount of simmering should help, as would adding a little water. 1. Last week I went to I Dream Of Falafil in the Loop. When they asked whether I wanted "regular" hummus or red pepper hummus, I felt Habibi's glaring presence and ordered "regular." 2. I also made hummus this weekend, and got use my relatively new pressure cooker. 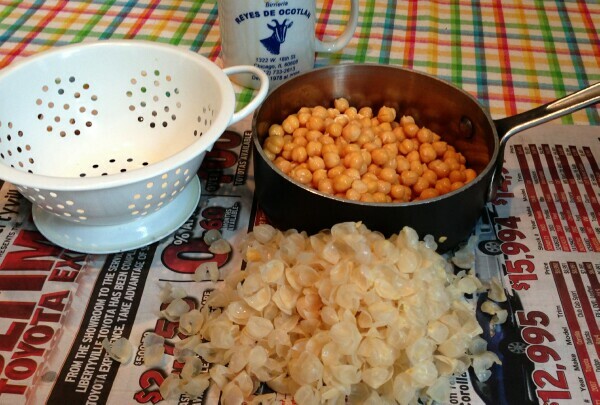 Dried chickpeas, without any presoaking, were ready in 30 minutes. I'm not sure the bean has that different a taste from canned (the texture is different, but you don't notice that in hummus), but what you do get by cooking them is a wonderful broth, which per Habibi's recipe, I used in the hummus, and it came out great. 3. 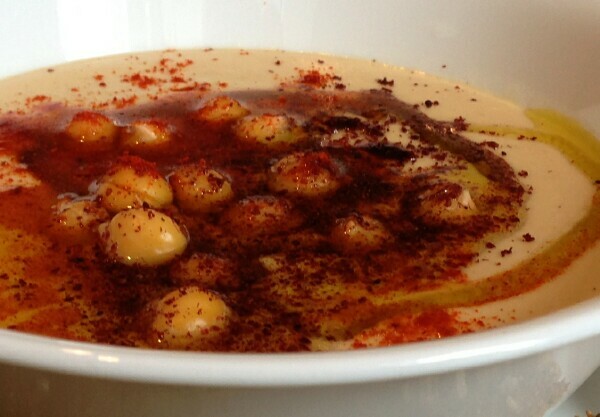 I didn't skin the beans, but to my taste, the hummus was plenty creamy. However, I noticed in the latest issue of Cook's Illustrated a hint that added a little baking soda to the beans and heating them a bit with the baking soda before adding liquid, which they claim greatly helps get rid of the skins. They said this worked for dried (but pre-soaked) beans and canned beans, as well. I tried it but the skins still looked impossible to peel. I would also be interested in a falafel recipe. It seems that the ingredients in falafel and hummus are somewhat similar. Habibi wrote: Here's my recipe. I think it's a damn F'ing good one. Half-way though started thinking Habibi's version of a snipe hunt. Habibi wrote: 10) DON'T F IT UP. Used a 29oz can of chickpeas, was not specified. Dusted with sumac, paprika and drizzle of olive oil. May have been a shade thin, though it was very smooth and the flavor was terrific, quite satisfying. 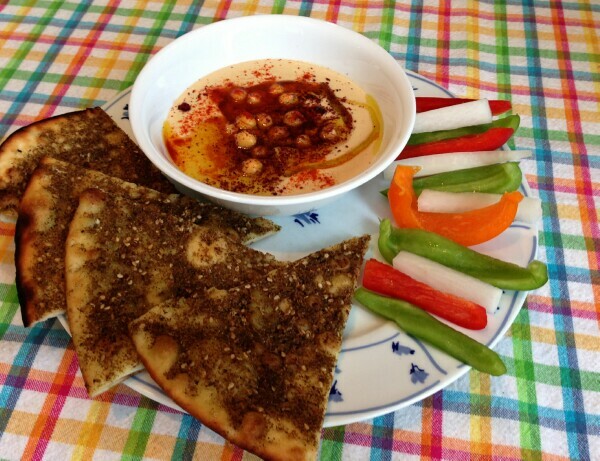 Habibi Hummus breakfast with Taza Bakery zaatar bread and veg. This has my mouth watering. I live in River North--could someone give me a couple of suggestions of where I might go to buy the tahini that Habib recommends? DutchMuse wrote: This has my mouth watering. I live in River North--could someone give me a couple of suggestions of where I might go to buy the tahini that Habib recommends? I live in River North too, & always hop on the Brown line & head to Albany Park (get off at the Kedzie stop). Any of the grocers there will carry a number of brands of tahini, including the ones mentioned upthread. I usually shop at Al Khayyam Bakery, Sahar Supermarket, and/or Sanabel Bakery, depending upon what else I need. All are on the main drag on Kedzie. Ouch! That just reconfirms my conclusion that getting rid of the skins just ain't worth the effort. Great thread. I have to reiterate the benefit of a little baking soda when soaking or cooking the beans. The skins pop right off with a little agitation and can be poured or skimmed off. I am also fond of substituting 1/2 the garbanzo beans with white beans/ cannelloni beans or the like. no baking soda this time! I tried the Cooks Illustrated technique of simmering with baking soda and then agitating to remove the chickpea skins. It works, but it is not effortless. It yielded very creamy hummus - what I will be calling 'company hummus.' Because for the hummus I make weekly - which just feeds little old me and is also very creamy - I have determined it is not worth the effort. By the way, I have steadily increased my usage of tahini. I used to think I didn't like the way tahini flavor was a little too forward in my hummus. Then I realized, I just didn't like the tahini that I was buying. Also, I'm sure my hummus has more of a citrus note than the original recipe posted here. But that's the way I like it. Also submitted for acceptable hummus toppings: snipped chives or chopped parsley (but not both). gastro gnome wrote: By the way, I have steadily increased my usage of tahini. I used to think I didn't like the way tahini flavor was a little too forward in my hummus. Then I realized, I just didn't like the tahini that I was buying. It took me years to realize this as well. Good tahini really does make all the difference. I've grown very loyal to Al Kanater. We just got a Vitamix 5200 two weeks ago. For those of you who have one, the Vitamix pretty much eliminates the de-skinning issue. The first batch I whipped up (skins on) was some of the silkiest and lightest hummus I have ever eaten. Those invited to the get-together said the same, even though they were unaware of the origins of the hummus. I would also mention my recipe modification of replacing the tahini with almond butter, but don't want to upset any purists. I don't mean to stir up a huge storm here (well, maybe I do), but dried chickpeas are the winner. 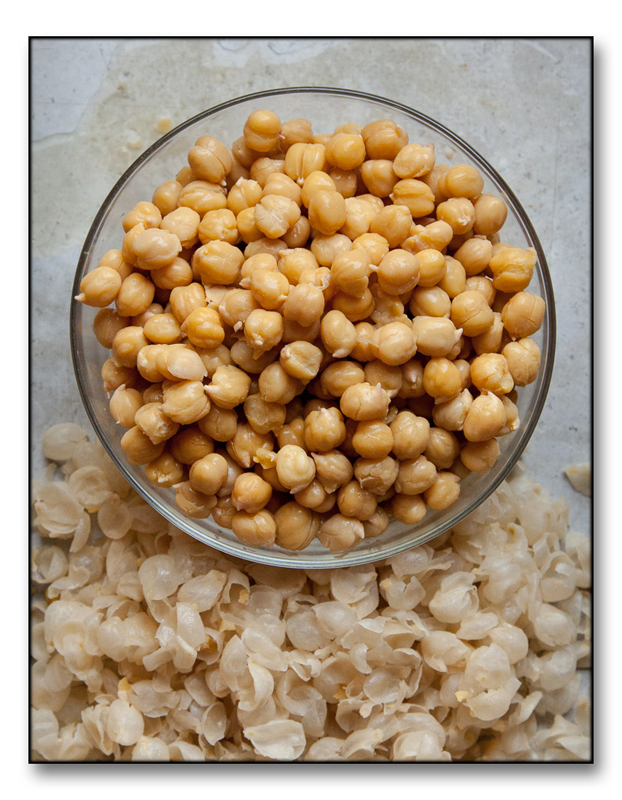 BR wrote: I don't mean to stir up a huge storm here (well, maybe I do), but dried chickpeas are the winner. And with a pressure cooker you can go from dried to perfectly cooked in about 25 minutes. I've been making hummus based on this recipe for the last few years. As mentioned upthread, I think that buying better quality tahini was the best thing the quality of the hummus. But following these simple steps has always yielded a tasty project. I did like the recent versions I've been making with dried beans enough to consider buying a pressure cooker. I have the Fagor Duo pressure cooker and am very happy with it. Besides beans, the other main thing I make are braises. Something that would otherwise take several hours can take 25-45 minutes in the pressure cooker. I haven't tried canning with it.